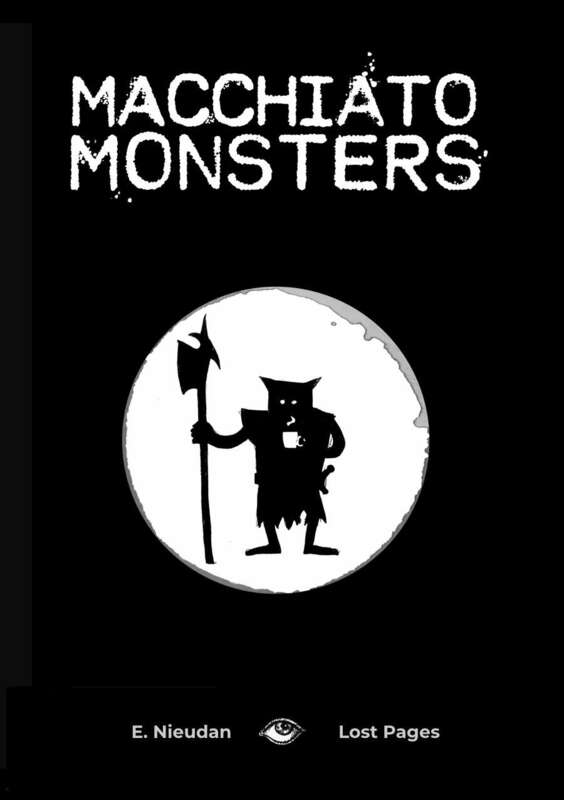 Macchiato Monsters is a rules-light, slightly collaborative, old school roleplaying game. It is not a game about coffee. Two years after the release of the Zero Edition, we come to you with a perfectly tuned engine for adventure, exploration and survival in all kinds of perilous dungeonverses, whether you're using published settings and adventures or create your own. Freeform characters: emulate a classic concept, or come up with something unique and help define the world. Risk dice: a simple attrition mechanic for armour, gear, encounters, treasure, and story progression. Flexible magic: invent your spells, and keep casting them as long as you have resources - and hit points - to fuel your magic. One-roll combat rounds: no initiative, no battle maps, no quarter given. Campaign tools: a panoply of tables and procedures to prep and improvise content. A while lot of illustrations of monsters having coffee! Layout & Lasagne by Paolo Greco. Art (some painted with actual coffee) by Russ Nicholson, Eric Nieudan, Guillaume Jentey, Jonathan Newell, Luigi Castellani, John Grümph, Luka Rejec, Clare Foley, Bronwin McIvor, Didier Balicevic, Christopher Stanley, Jops. Editing by Fiona Maeve Geist. First on p.7 you say "reroll your hit points instead" - I'm not sure what the "instead" refers to and suspect it just needs to be deleted. On that note - what if you increase your HD and roll fewer HP than before - does that just stand? Second - I was initially not expecting much from this and then I saw the initial equipment / wealth rolling system and was blown away that it was just as cool as Into the Odd and then I saw how money and treasure work and just goggled in amazement. I haven't gotten through the rest of this slim volume yet but now I expect to be blown away every page or two...no pressure. There may be something wrong with the email settings. You can grab the bundle linked above at no cost, assuming you're using the account that purchased MMZ. Is there a preview anywhere? Gain one hit die.Roll your hit dice and record you new hit points total. Big fan of Macchiato Monsters since the Zero edition. For me it's got the right combination of random tables, useful rules, and open spaces to encourage more free-form play. I played a game with the designer and it was fast, fun and easy - just what I wanted. Great for convention games, short-form campaigns, or beginners just starting out. Recommended! Macchiato Monsters is a bloody good game ! It's clever, full of tables and fun playing things and very easy to understand and run ! For those who bought MM Zero, will be there an update or a discount? Or do we have to buy new version? Per Paolo and Eric on G+, they will be sending out links or something to MM Zero purchasers. I paid the six because IMO the old four bucks plus six here, ten bucks total is a bargain. This new edition is beautiful. The game is a really top-notch hybrid of what the author likes best of Whitehack and The Black Hack with other stuff in there too. I've been using the "secret beta" document for a year or so, and this is my favorite game bar none right now. If you like OSR with very streamlined, but in no way bare, rules, you should get this. The art is great, full of character, and the layout is totally pro -- clean and simple without being boring. This is a game that would be written by a computer with an artful soul and a sense of humor. GET THIS NOW, OSR FANS. I don't know where the cover is, though! No cover page on the PDF!!! I will post a proper review when time permits.